Create easily your wedding gift list and receive the money into your bank account. Customize it to your liking by adding every gift idea you want, include for example your honeymoon stages. Your guests will love the chance to give you the best present possible for your big day! Want to share your gift list in an elegant way? Order your free wedding cards with your gift list details on it and include them in your invitations. Add the coolest gift ideas to your list and receive the cash equivalent in your account. You will receive all guests' contributions in cash, and you can then transfer the money directly to your bank account to spend it on whatever you want. You can send thank-yous directly from your mobile, and also download a breakdown of the contributions received. Discover the easiest, most elegant way of receiving gifts from your guests! Zankyou guarantees total security with payments. Your money is always held in your name, and complies all European safety standards. Our payment portal is international, and supports revenue from all areas of the world, in the currency and the most used payment methods of your country: credit/debit card, transfer, check, etc. 100% cash: Each contribution has a service cost of 2.60% + 0.85p and for premium customers 2.25% + 0.50p per present paid. Download the free Zankyou APP, and have complete control over all of the payments you receive, and thank your guests directly. Receiving gifts has never been easier! Our service is managed by Lemon Way, a hybrid payment system that guarantees the management and control of any and all financial flow. Your money is always in your name, and the platform complies with all security standards mandated by European electronic trade regulations. It's very simple! We offer you a wide catalog of gift ideas sorted by brands and categories. Once they are on your list, you can change them at will! You can also create your own present ideas with a simple form where you just enter a price, a description and a picture. You can even add the steps of your honeymoon, which will then be shown on a map for a rendering always more playful for your guests! 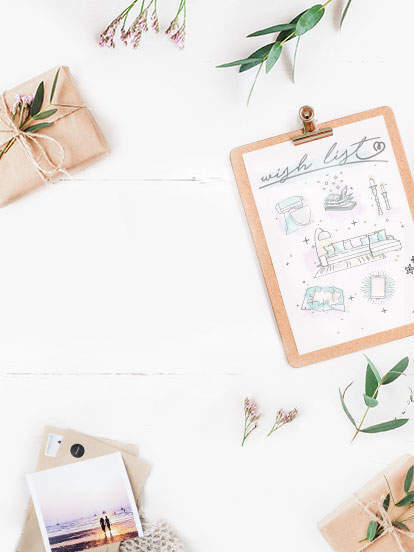 You will find everything you need to know about your big day: how to get to the venue with maps, nearby hotels you can book, replies from RSVPs, and contributions to presents, amongst a whole host of other things. Share all the information for your marriage in one click! It will allow you to directly receive your guests' contributions in cash, in a much more personal way. Alongside the money, you will receive a personalised congratulations message, and we know that your guests will love to feel that they are giving you something you will like.